Let’s say you and your spouse both are 50-years old right now. You have saved about $200,000 in retirement savings in addition to some equity in the house. It is not bad at all. In a short 12 years from now, you will be 62. You may or may not retire at 62, but you decide to at least make plans to retire at 62. You also plan to accumulate retirement assets worth $1 million. To help with an illustration of this journey, we take the help of our hypothetical couple, John and Lisa. We admit it is just a number and so many people, continue to work beyond 62 years of age. However, it is significant in many ways. At 62, you become eligible to draw on your social-security benefits even though your benefits are lower than if you were to wait until the full retirement age between 66 and 67. After you are 59 and a half, you can withdraw money from your retirement saving vehicles like IRA and 401K without any penalty. However, please note that one does not qualify for Medicare until the age of 65. So, if one does decide to retire at 62, he/she would have to buy their own medical insurance for the intervening period (from 62 to 65). Another reason 62 is a good number from a planning perspective. Even if you continue to work beyond 62, it is better to plan for early to cover any exigency. Until the early 2000s, there used to be a consensus amongst the financial planners that one million dollars were sufficient to have a very comfortable retirement. However, not everyone agrees to this milestone anymore. Obviously, one million dollars are not the same as it used to be 20 years ago. Even though the inflation has been low in the last 20 years, one million in the year 2000 would be the same as $1.45 million in 2018 due to inflation. A one million dollar mark does not guarantee a rich retirement, but with some prudent planning and strategies, one million dollar worth of savings can go a long way to fund a comfortable retirement for a couple provided we believe that the other pillars of retirement security like Social Security and Medicare will remain viable. On the other side of the fence, there is an argument to be made that it is too high a target for so many folks, who may have done everything right but invariably run into the tough times due to corporate layoffs, constant shift in the job market and age discrimination in later years. This is why it is so important to have an emergency reserve of one year worth of living expenses. Still, we believe, the most important factor that determines how rich you are going to be later in life has to do with how soon you are willing to start saving paying yourself first, in other words, start saving for retirement. The table below shows how the early savings can impact the quality of life in later years. Mark starts contributing $6000 a year ($500 a month) at age 29 and increases it by 3% every year until 62. However, Steve waits for another 10 years but starts saving the same amount as Mark at age 39. Assuming they both get 8% return annually, Mark ends up almost double what Steve could accumulate. Table: Power of saving early in life. According to the Economic Policy Institute, the national average of retirement savings for 45-49 years olds is $81,000 and $124,000 for 50-54-year-olds. So, 50 being right in the middle would be about $100,000. Considering that for a couple, it should be twice of that figure, let’s assume that you have saved $200,000. Obviously, it is not enough. Once you get to the retirement planning process, suddenly the seriousness of the matter downs upon you. You realize you cannot delay it any further. Sure, you may have other pressing needs such as saving and paying for kid’s college tuition fees. As a good parent, you want to fund the college for the kids, but there are other ways to meet these needs like tuition loans at least partially. Also, kids can work part-time to fund their own education partly. At this stage, retirement savings have to become the priority number one. In the past, we have taken help of our hypothetical couple John & Lisa for our retirement case studies. This time is no different, and we will seek their help. This is where John & Lisa stand today. Both of them are 50 years old. Their combined annual salary is modest at $125,000. They have $200,000 in their retirement accounts. John and Lisa decide to take their retirement planning to the next level. After all if not now, when will it be? They only have about 12 years left for retirement. Sure they can work longer, but that may not always be their choice. John and Lisa decide to save 16% of their salary towards their 401Ks. These savings will be tax-deferred and reduce their tax liabilities. Until now they have been saving only 6% of their incomes. Their employers, on average, match 80% of the first 6% of the contributions. They have had no IRAs until now. They will put away $10,000 ($5,000 each) towards IRAs. Since they qualify for tax-deductible IRAs, they will use this option instead of Roth IRAs. This will also help bring down their taxes. They will also open a college education fund for their kid and deposit $5,000 every year. However, this will be after-tax, but the qualified tuition withdrawals including the growth will be tax-free. Their target is to reach one million in retirement savings, excluding the primary house. With the above decisions, and after accounting for the tax-savings (due to pre-tax contributions), their take-home income will reduce by $1,500, even though they will be saving an extra $1,980 every month. Where to find an extra $1,500 a month? They could cut their spending budget drastically from every expense item and save $1,500 a month. Though doable, but seems difficult to achieve. Their house is worth about $350,000. They still have a mortgage balance of $150,000. After mortgage payout and commissions, they can get about $190,000 net. If they move a little further out in the suburbs and buy a smaller house, they could get a new house for $250,000. If all that works out, they can take only about $100,000 new mortgage on a 15-year term, put 150,000 cash down on the house, put $25,000 away as an emergency fund, and still will be left with $15,000. They will use this $15,000 towards paying off one of the cars. Their monthly mortgage would be about $775. After property taxes, insurance, etc. their monthly expense would be approximately $1,500. They save about $500 a month in house payments, plus they will immediately save $400 in car payments. Also, the house is new and smaller, so they would save about $150 a month in utilities; however, that will be a washout partially since Lisa will spend more fuel on the car for office commute. They realize that they spend an unbudgeted amount of about $1,500 a month on things that are wants and mostly not essentials. They can easily cut $600 a month without too much sacrifice. With the budgeted savings of about $1,500, they can fund the college savings as well as fund the 16% pre-tax contributions to 401K and $5,000 each to the IRAs. The first very important part of the retirement planning is to save enough and save regularly. It is best achieved when it is done on auto-pilot. Being on auto-pilot means you always get paid first before you get money into your checking account to spend on things that essential, and non-essentials. John decides to deploy a risk-adjusted strategy to ensure that he gets most of the gains of the market, but at the same time, he will hedge the risks in case of this bull market turns into a bear market. This strategy is discussed in the later section. Lisa’s company provides a set of funds that she can choose from. Lisa decides the following combination of funds. Once this has been set-up, rest would really be on auto-pilot. Every pay-check, her contributions will be invested in the proportions as selected by her. Since this portfolio is very balanced, she hopes to get growth of about 8% annual for the next 12 years. Since both John and Lisa will be funding their IRAs every year to the extent of $5,000 each, they will self-manage these funds. Lisa is a fan of DGI (Dividend Growth Investing) stocks and decides to implement a DGI Portfolio (described in the later section). John decides to be a little aggressive and will like to implement an income-oriented strategy for his IRA. He will implement a “ High-Income portfolio,” which would aim to generate about 8% income. John does not need income today, so all of the distributions/income will get re-invested. Also, since they are going to contribute the funds gradually for many years, they will be taking advantage of dollar-cost-average while building this portfolio. Since this portfolio is a bit high-risk, the staggered buying approach will reduce the risks as he will be buying high as well as low. The company has paid dividends in the last 10 years and never cut the dividend. It has increased the dividend payout at least 5 times during the last 10 years. The yield at the time of buying is at least 2%, but preferably more. The price is at least 10% below the 52-week high. John’s IRAs will be used to implement this strategy. This basket will consist of high-income securities to generate roughly 8% income. Realty Income Corp. (O), Omega Healthcare Investors (OHI), STAG Industrial (STAG), STORE Capital Corporation (STOR), Ventas, Inc. (VTR). Ares Capital Corporation (ARCC), Main Street Capital Corporation (MAIN), Annaly Capital Management, Inc.(NLY), Golub Capital BDC (GBDC), New Residential Investment Corp. (NRZ). Cohen & Steers Tot Ret Realty (RFI), Cohen & Steers Infrastructure (UTF), BlackRock Taxable Municipal Bond (BBN), Kayne Anderson MLP (KYN), Tekla Healthcare Investors (HQH), PIMCO Dynamic Credit Income (PCI), Columbia Seligman Premium Tech (STK). Since John is implementing this strategy within his 401K, the strategy needs to be simple and implantable. Most 401K accounts offer a limited number of funds that one has to choose from. John decides to implement one such strategy which rotates on a monthly basis. This strategy may not be most efficient or provide the most return, but it is simple and easy to implement. VBMFX is the hedging asset and will be used only when the other two main securities are not performing well. By deploying this strategy, since 1997, the worst year return was -7.86% in 2015. In the year 2008, it was down only -5.50% compared to -37% for S&P500. Every month, the strategy will check the performance of the three assets for the previous six months and select the best performing asset. The portfolio will be invested in the top performing asset for the next month. The process will be repeated every month. Below is the back-testing results since 1997 and performance comparison with S&P500. 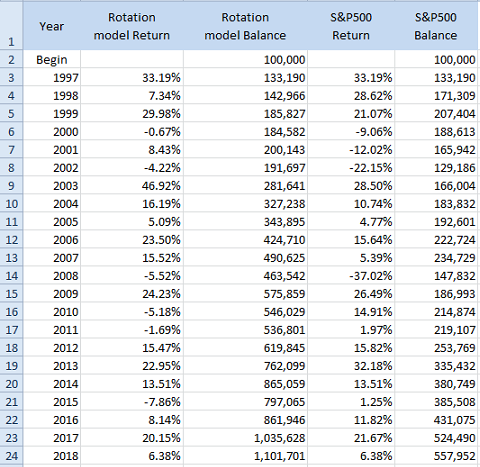 The model portfolio accumulated more than double of the S&P500, mainly because of smaller drawdowns during the bear markets of 2001-2003 and 2008-2009. As you would observe, in the above model, John and Lisa actually exceeded their targets. Some would question the constant rate of return in the above portfolios. It is almost guaranteed that some years, they would have negative returns but then high returns in some other years. So, we do expect them to balance out. We particularly feel confident of the long-term performance of the DGI portfolio and the Rotational Portfolio using SPY/VTI/TLT. The idea here is that John and Lisa are not only diversifying in various stocks, but also in the form of various strategies and assets. Also, another important message this exercise is trying to send is the importance of a high rate of savings. Out of the final total $1.25 million, their own contributions were nearly 50% at $616,000, besides $627,000 from growth. Savings and Investing wisely are the two legs of the three-legged retirement stool, the third being the Social security. Disclaimer: The information presented in this article is for informational purposes only and in no way should be construed as financial advice or recommendation to buy or sell any stock. Please always do further research and do your own due diligence before making any investments. Every effort has been made to present the data/information accurately; however, the author does not claim 100% accuracy. Any stock portfolio or strategy presented here is only for demonstration purposes. We offer “High Income DIY Portfolios” Marketplace service. The primary goal of the service is high income with low risk and preservation of capital. The service provides the DIY investors with vital information and portfolio & asset allocation strategies to help create stable, long-term passive income with sustainable yields. We believe this service is appropriate for income-seeking investors, including retirees or near-retirees. We currently provide five portfolios, including two ‘High-Income’ portfolios, a conservative strategy for 401-K accounts, a ‘Sector-Rotation’ strategy, and a ‘High-Growth’ portfolio. For more details or 2-week free trial, please click here or on the image just below our logo at the top of the article. Disclosure: I am/we are long ABT, ABBV, JNJ, PFE, NVS, NVO, CL, CLX, GIS, UL, NSRGY, PG, ADM, MO, PM, KO, PEP, D, DEA, DEO, ENB, MCD, WMT, WBA, CVS, LOW, CSCO, MSFT, INTC, T, VZ, VOD, VTR, CVX, XOM, ABB, VLO, MMM, HCP, O, OHI, NNN, STAG, WPC, MAIN, NLY, ARCC, DNP, GOF, PCI, PDI, PFF, RFI, RNP, STK, UTF, EVT, FFC, HQH, KYN, NMZ, NBB, JPS, JPC, JRI, TLT.